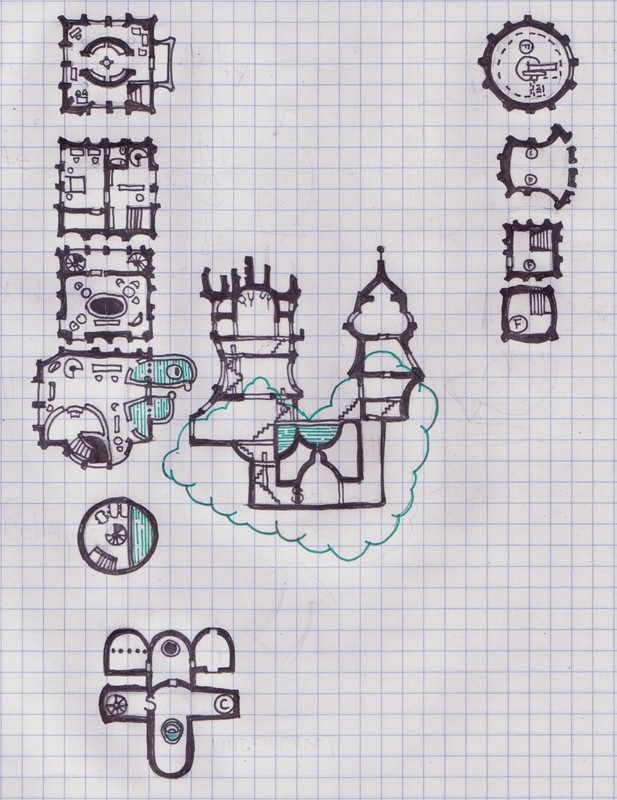 Dungeon of Signs: MAP - Cloud Castle or at least Cloud Manor. So I drew up the map below because I was thinking about cloud castles, and I think it turned out to be an interesting lair style dungeon. I figure it's a strange sight spotted floating about the wilderness sometimes, a dark permanently storming cloud, with a pair of gleaming white towers visible perched atop and within it. Rumormongers might know that in ancient times (or only a few years ago - doesn't matter) it was used by a powerful wizardly overlord as a traveling feast hall, with which he would circle his domains, bringing rain and accepting tribute from his floating palace. More like a pleasure barge then a home, it was known as "Thunderhead Manse" and richly furnished to impress yokels and other visitors. I can think of a couple things that could make it an adventure area. The first scenario involves a renegade gang of the (now vanished) wizard's flying monkey guard, who float around at random, ransacking towns, demanding tribute and turning the Manse's lighting cannon on those who resist. The monkeys are armed with Arcquebus' - odd mechano-arcane weapons that fling arcs of electricity at their enemies, but otherwise they're basically a band of flying buccaneers putting on airs. Led by a monkey captain claiming the name "The Storm King" this might make a pretty funny (or extremely deadly - because 20 - 30 2nd level flying humanoids that have some military discipline and strategy can be pretty tough) adventure. Otherwise the place would make a good lair for a dragon. I'd go with a blue dragon, or better phantasmagoric wyrm. A long ribbon of magic and madness, coiled in the library atop the manse and served by the phantoms of the cloud castle's former servants and guards. the whole place could be infected with the dragon's madness, with dream beasts materializing out of the cloud to strike an threaten. Air elementals or a young cloud giant dandy see like possibilities as well, but less exciting. The map itself would need some processing before being useful - a key of course, with the levels named, and all the excess grid removed. I've presented the raw version here because I haven't decided what to do with this (if anything yet). I think for any PDF, I'd also break up the map into sections for the tower, cellars and manse, all tied back into the elevation. This is another great map. I 'll be saving this one- I have a cloud castle in my Valley of Bones mini-setting. It is full of meddling elfs. I'll definitely use your map if I don't get around to doing my own. I have that tower you did recently (the one with the rookery) saved for a similar reason. And while were at it, I am certainly going to drop that tank you did a while back somewhere in there as well- it fits my setting's ancient history perfectly. Any updates on this map/adventure? Will you be making it available? I used a different map, it was a 1 page dungeon contest finalist a few years ago. Thunderhead Manse. You can find it on the PDF page.